Unicycle Rose: Are you up for Unicycle Rose’s 2011 Balance Challenge? Are you up for Unicycle Rose’s 2011 Balance Challenge? Eh hem. Ladies and gentlemen, this is hereby your personal invitation to come along on this All-American Girl’s Balancing Act (2011 Edition). End of formality. Read on and join me! Looking back over the year, I slipped away from my original intent of blogging. Unicycle Rose was born to help myself maintain balance in this hectic world of kids, job, spouse, pets, chores, love life, faith, exercise, friendship, environment, extended family, inner-peace, food, vino and the list goes on and on to that big slab of cheese in the night sky (so it seems). How do we do all that we need to do in such a way that one part is not neglected nor another overdone? The results of being out of balance in any of these areas result in guilt, tight pants, marital discord, overflowing smelly hampers, ignored kids, hangovers, illness and emptiness. Just to name a few. Again, this list can grow faster than a speeding unicycle tire can turn. For example, a Balance Challenge relating to relationships. “Be kind to unkind people” ... Today attempt to be nice to that person in the office, the street, or your family who is really grating on your nerves. Pick them out ahead of time so you will be prepared to schmooze them with unexpected kindness. Or, why not a balance challenge relating to health (be kind to your back); shoulders back, chest out….today why not try to balance something on your head for a minute or two while you cruise the house? It will slow you down, fix any slouch and make you aware of posture. Plus it will be fun. Grab the remote control and fold the clothes while it sits on your head. Or, a love Balance Challenge? You know how important passion is in marriage. And, without effort, passion disappears faster than pounds on The Biggest Loser. Give your spouse a hot, passionate kiss out of nowhere and note their reaction or unreaction. This year I am tuning myself up. 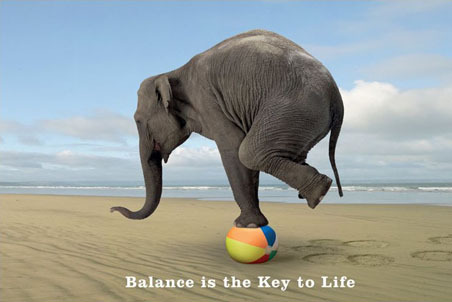 When I post, I will toss in a Balance Challenge that I will attempt to work into my day, and you can too. Every challenge may not be for you, but I promise that one or two will dare you to get out that oil can and lube some part of your life. Some will put me out of my personal comfort zone (like going to a movie alone) and others will be as easy as making time for a hot bubble bath. The goal? To be a whole, well-rounded, sane woman with minimal wobbling or falling in 2011. Minimal. Falls are part of learning to keep balance. Oh, do I know that truth on and off my unicycle Blanche! So tomorrow, the first day of the first month of the brand-spanking New Year we will hop on to Unicycle Rose’s Balance Challenge. I may not be able to ride a unicycle, but I will probably be up for some of your challenges. Count me in.